Vodafone taking BlackBerry Storm pre-orders | BlackBerry Blast! 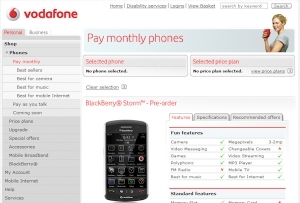 Vodafone UK is now taking pre-orders for the BlackBerry Storm. The new BlackBerry is expected to be in stores on November 11. You can head on over to Vodafone's web site at the link below to check out the details. The web site says you can order one and have it delivered to you by November 18.